IK Multimedia, makers of the ever-popular iRig guitar interface, has announced the iRig Nano Amp, a micro amp with built-in iOS interface. 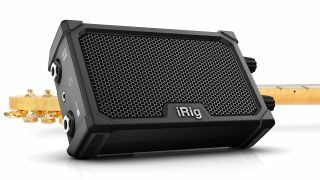 The iRig Nano Amp features a 3" speaker with 3W class A/B power amp, and can be used as a standalone amp, as an iOS interface, with headphones or to drive a cabinet - right up to a 4x12 - via a 1/4" output. Standalone Amp mode features volume and gain settings, as well as a normal/bright output; it's British-voiced to deliver cleans up to overdrive at higher gain levels. In Device mode, the amp's integrated iRig circuit connects to an iPhone or iPad via an included 1/8" TRRS cable for access to AmpliTube's amps and effects. The amp can be powered by three AA batteries, while a built-in kickstand offers an improved monitoring angle. IK Multimedia's iRig Nano Amp is available now for a surprisingly affordable £49/€49/$49 - head over to IK Multimedia for more.